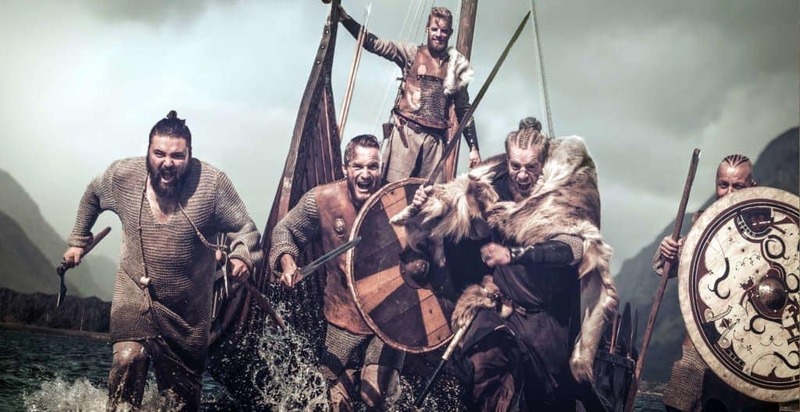 If there was one thing the primarily Saxon inhabitants of Great Britain were accustomed to in the 8th century, it was raids on their shores by the men of the north, the so-called Vikings. Since they first landed in Norfolk in 787 AD, the daring Norse raiders had returned to British soils in search of plunder almost every summer. Typically, areas of wealth such as monasteries and priories were targeted, leading to Christian contemporary sources labelling these invaders ‘Heathens’. For the early part of the 9th century, Viking raids were unco-ordinated and would usually end in the Danes being paid to return to their homeland – a tribute that would become known as Danegeld. These raids were prevalent throughout the 800s, with sources like the ‘Anglo-Saxon Chronicle’ and the ‘Annals of St. Bertin’ reporting widespread pillaging, as well as notable skirmishes that included a battle with King Aethelwulf in Carhampton. Every time, the Vikings would make land, raid and pillage, and would then depart with their coffers full. However in 865, usual custom was disrupted. A sizeable Viking force – estimated to be around some 3,000 men – landed on the Isle of Thanet in Kent with little intention of accepting a payment of Danegeld. Instead, these Vikings, who appeared to have organised themselves into a fleet of many ships, struck north from Thanet, cutting a swathe across East Anglia which was only halted when the local populace brokered a tentative alliance with the invaders that involved supplying them with horses. Their intention: to seize England itself. It seemed that after years of lucrative raids, the Vikings had decided greater wealth could be attained by simply taking as much of the land as they could by force. It is at this point that, as so often is the case with the Vikings, myth and history begin to blur. Contemporary Anglo-Saxon sources contend that the Viking force was comprised of powerful jarls who had banded together – despite their usual acrimonies – for mutual benefit. The series of kingdoms that made up England would be much more easily defeated with a unified force. In contrast, the Norse Sagas record a far more poetic reason for the raid, and it revolved around the Norsemen’s most famous hero: a certain Ragnar Lothbrok. The 13th-century Icelandic sagas that attempt to detail much of Ragnar’s supposed life claim that the reason for the Viking invasion of Great Britain was in revenge for Ragnar’s death at the hands of King Ælla. Of course, modern historians place significant question marks over Ragnar’s interactions with the Northumbrian King Ælla. It is much more likely that Ragnar was the man who raided Paris and eventually settled in Ireland and thus raided England’s west coast, as opposed to the east coast that the Great Heathen Army harried. The sagas proclaim that it was Ragnar’s sons who led the vast Viking force that invaded England. Indeed, the feared chieftain Ivar the Boneless’ remains are said to be located in a mass grave near Repton, Derbyshire. However, whether these powerful Norse leaders – that also included Halfdan Ragnarsson, Ubba and Bjorn Ironside – were in England to avenge Ragnar’s death remains an enormously contentious issue. It seems far more likely these men of great standing in Viking history would have been in England to reap the many riches it had to offer – and reap them the Great Heathen Army did. After wintering in East Anglia, they rode northwards on their new steeds to Northumbria. Faced with little resistance from King Osberht and Ælla of Bamborough, the coalition of Vikings – headed by Ivar the Boneless – made swift progress and by 867 AD had captured York and installed a puppet leader. It is during this siege that ‘The Tale of Ragnar’s Sons’ contends that they captured Ælla and subjected him to death by blood eagle to avenge Ragnar’s death. From there, the Vikings again made their way southwards into East Anglia where they met with Edmund the Martyr. Given that England consisted of four kingdoms at the time, the Vikings made short work of their fragmented foes. Edmund the Martyr’s forces were defeated, while he was tied to a tree and shot full of arrows for refusing to renounce his own Christianity. Their bloody work complete, Ivar’s army then pillaged churches and priories abound, before setting their sights on Wessex. Ruled by Alfred the Great’s brother, Aethelred, Wessex put up a staunch defence and were victorious over the Heathen Army – which by now had been supplemented by Bagsecg’s Summer Army. The Vikings and the Kingdom of Wessex continued to trade blows throughout 871 and 872, during which time the Heathen Army wintered in London. However, a rebellion in Northumbria drew their attention, where they returned to restore power, before moving south to Mercia. Following a payment of danegeld, peace resumed and the Vikings made camp in Repton, Derbyshire. It is here that a mass grave is believed to contain the body of Ivar the Boneless, the Great Heathen Army’s prestigious leader. By 873 and having been in the country for eight years, the Heathen Army split; half of the marauding force travelled north under the stewardship of Halfdan Ragnarsson and raided Scotland, while the other half moved south. Following Halfdan’s exploits in Scotland, he returned south and Northumbria was divided up between the invading army. Thus, Vikings began ploughing the land and establishing farms. In the south, the remnants of the Heathen Army, now led by Guthrum, finally came into contact with Wessex again when they began raiding King Alfred the Great’s kingdom, culminating in the Battle of Edington, in Wiltshire, where the Vikings were defeated at last and Guthrum agreed to be baptised. Subsequently, much of the north and east of England was gifted to the Viking invaders who for the most part had terrorised these territories for nearly a decade, and the Danish kingdom of Danelaw was established alongside the last remaining kingdom of England: Wessex. What originally began as a series of unco-ordinated raids during the late 8th century, and later morphed into a full-scale invasion, finally became a case of permanent settlement for the Scandinavian seafarers. As such, Norse influence on Britain would grow over the coming years, as more Vikings assimilated into the proverbial melting pot that became Anglo-Saxon/Norse culture. For the next two hundred years until the Norman occupation – who themselves were descendants of Rollo, a famous Danish chieftain – Vikings would occupy much of the north and east of England. Thus, over a thousand years later, England – and many other parts of the UK – would not be what they are today without the profound influence the Vikings, and in particular the Great Heathen Army, had on its shores. By Josh Butler. I am a writer with a BA in Creative Writing from Bath Spa University, and a lover of Norse history and mythology.